Travel Lane County&apos;s online advertising is exclusively available to members! This past year there were nearly 1 million website visits by almost 700,000 unique users. The website serves up visitor information by area of interest, region and city. Thirty percent are residents or in-market visitors and the remainder are out-of-area users at various stages of planning. Online advertising is integrated subtly throughout the EugeneCascadesCoast.org website for a cohesive user-experience. Ad spots include everything from straight forward banner ads to prime photo placements and listing order. Advertising is secured on a first-come, first-served basis. 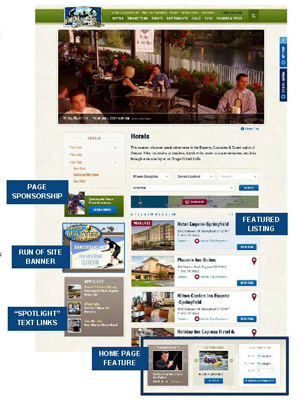 Destination Travel Network manages Travel Lane County&apos;s website ad space. DTN is a division of Simpleview, Inc., Travel Lane County&apos;s website provider. For advertising questions and information contact Andy Martinez, DTN Associate Account Executive at 520.284.1008.